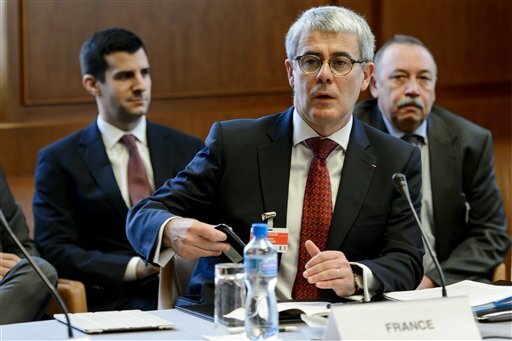 Audibert, a senior diplomatic adviser to President Francois Hollande, is said to have told Reps. Loretta Sanchez (D., Calif.) and Mike Turner (R., Ohio) in a recent meeting that congressional disapproval of the deal could be beneficial and help world powers secure more favorable terms. The comments, which were first reported Thursday by Bloomberg, are directly at odds with recent remarks by Secretary of State John Kerry, who has argued that a rejection of the deal would destroy international sanctions on Tehran and push it to pursue nuclear weapons more aggressively. The initial report of Audibert’s comments prompted a quick pushback by the French Embassy, which was pressed to do so at the behest of White House officials, who were reportedly panicked over the report, according to sources apprised of the situation. The comments “directly disputed Kerry’s claim that a congressional rejection of the Iran deal would result in the worst of all worlds, the collapse of sanctions and Iran racing to the bomb without restrictions,” according to Bloomberg. Eric Schultz, White House press secretary, also took to Twitter to push back against the report. While Kerry and senior Obama administration officials claim that congressional refusal to lift sanctions on Iran would collapse sanctions and push international entities to do business in Iran, Audibert disagrees.